Rosental, C., Weaving Self-Evidence. A Sociology of Logic, Princeton (NJ), Princeton University Press, 2008. Abstract: The development of theorems in logic is generally thought to be a solitary and purely cerebral activity, and therefore unobservable by sociologists. In Weaving Self-Evidence, French sociologist Claude Rosental challenges this notion by tracing the history of one well-known recent example in the field of artificial intelligence - a theorem on the foundations of fuzzy logic. Rosental's analyses disclose the inherently social nature of the process by which propositions in logic are produced, disseminated, and established as truths. Rosental describes the different phases of the emergence of the theorem on fuzzy logic, from its earliest drafts through its publication and diffusion, discussion and reformulation, and eventual acceptance by the scientific community. Through observations made at major universities and scholarly conferences, and in electronic forums, he looks at the ways students are trained in symbolic manipulations and formal languages and examines how researchers work, interact, and debate emerging new ideas. By carefully analyzing the concrete mechanisms that lead to the collective development and corroboration of proofs, Rosental shows how a logical discovery and its recognition within the scholarly community are by no means the product of any one individual working in isolation, but rather a social process that can be observed and studied. 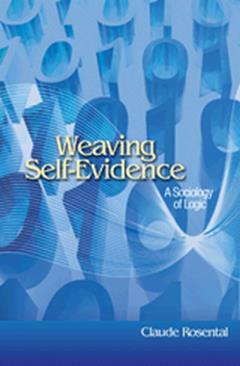 Weaving Self-Evidence will interest students and researchers in sociology and the history and philosophy of science and technology, and anyone curious about how scientists work.